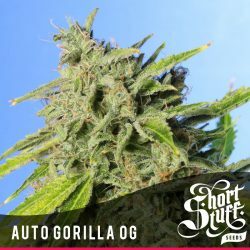 We are great friends with the guys at Shortstuff seeds and our very proud to be the first place you will be able to buy shortstuff Auto Gorilla OG female seeds. Auto Gorilla OG is a new strain from the autoflowering experts at shortstuff seeds which combines the highly resinous Gorilla Glue #4 with the super potent auto OG kush. The resulting strain has been described as the ‘most exciting autoflower strain’ ever seen and has been creating a real buzz on the forums. Auto Gorilla OG comes in packs of 5 female seeds for £32.49 but we are able to offer discounts when you buy multiple packs so 10 seeds costs you £57.99 and 20 female seeds will be £99.99. As well as an excellent price we are still running our shortstuff seeds promotion where you get 2 free female auto assassin seeds with ever pack of shortstuff seeds purchased – just enter promo code SSTUFF2AA in the coupon code box when you checkout.